230 pages | 1 B/W Illus. This book presents an intellectual history of today’s Muslim world, surveying contemporary Muslim thinking in its various manifestations, addressing a variety of themes that impact on the lives of present-day Muslims. Focusing on the period from roughly the late 1960s to the first decade of the twenty-first century, the book is global in its approach and offers an overview of different strands of thought and trends in the development of new ideas, distinguishing between traditional, reactionary, and progressive approaches. 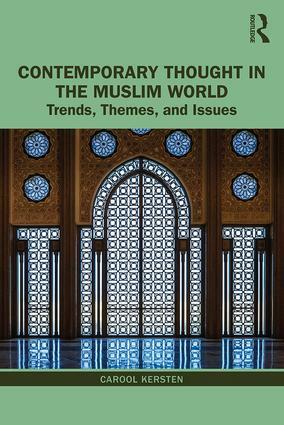 It presents a variety of themes and issues including: The continuing relevance of the legacy of traditional Islamic learning as well as the use of reason; the centrality of the Qur’an; the spiritual concerns of contemporary Muslims; political thought regarding secularity, statehood, and governance; legal and ethical debates; related current issues like human rights, gender equality, and religious plurality; as well as globalization, ecology and the environment, bioethics, and life sciences. An alternative account of Islam and the Muslim world today, counterbalancing narratives that emphasise politics and confrontations with the West, this book is an essential resource for students and scholars of Islam. Carool Kersten is Reader in the Study of Islam and the Muslim World at King's College London, UK. His previous publications include A History of Islam in Indonesia (2017) and Cosmopolitans and Heretics: New Muslim Intellectuals and the Study of Islam (2013).